If you're coming to this giveaway before midnight CST 12/13/14, the latest and current giveaway is HERE. Between 12/13/14 and midnight 12/20/14, the current giveaway will be here. There are 24.983450126 days until Christmas (educated guess). 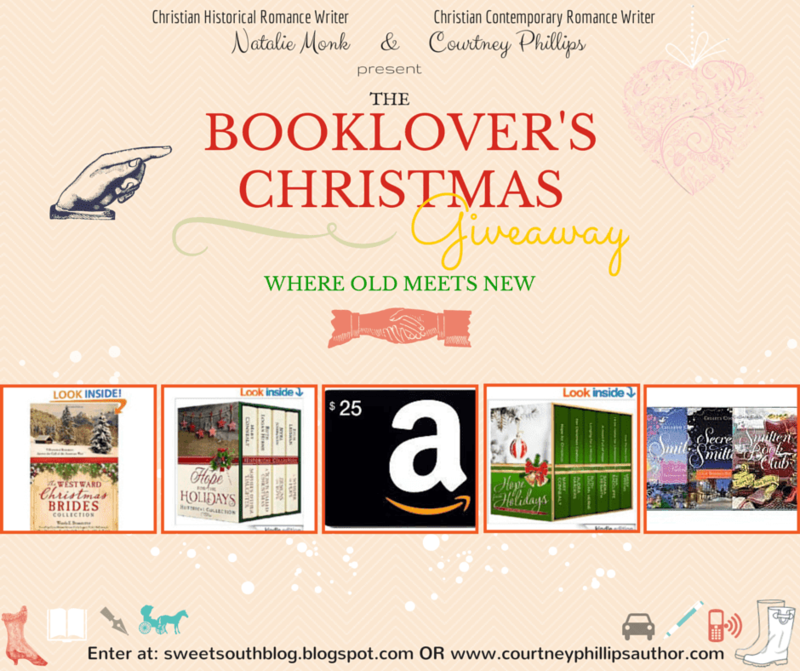 And I'm diving into the glittery reservoirs of the Christmas spirit by teaming up with my friend and fellow inspirational romance writer Courtney Phillips to bring you this sensational Christmas giveaway! 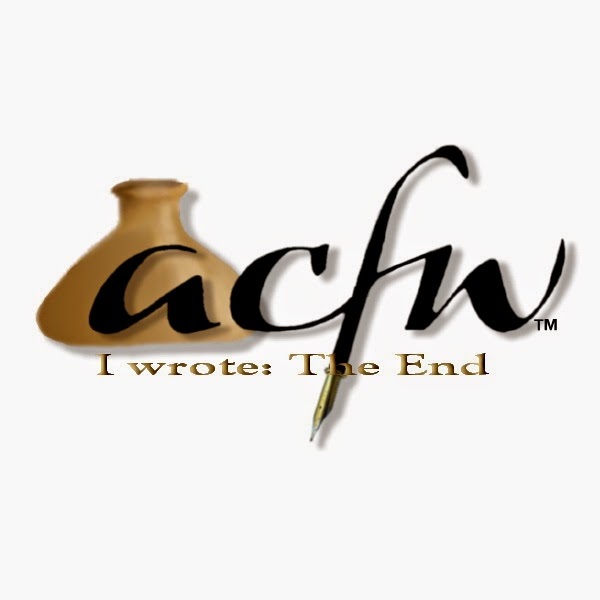 Calling all writers!!! Courtney and I are each giving away a five-page critique! To enter this merry giveaway via the Rafflecopter near the end of this post, all you have to do is show your support of our writing by joining our email newsletters. It's that simple, folks. (We promise to never send spam or clog your inbox.) If you've already signed up, just fill in the Rafflecopter space below with the email address you used to sign up for the newsletters. This week, we're giving away The Westward Christmas Brides Collection as an e-book! Psst! If you're seeing this on or after 11.6.14, the next part of the giveaway is already up and running HERE. She writes contemporary, I write historical. She publicly professes a dislike for sweet tea, beans, ham, & coleslaw. I eat EVERYTHING. (Okay, not everything. I don't eat gift wrap.) Um... Where was I going with this again? We both like reading God-honoring Christian love stories, both historical and contemporary. We're both currently pre-published and building our newsletter lists. AND we both wanted to give y'all something this Christmas, just for being Awesome You!!! Happy Christmas to all and to all a good book! If you'd like to read a sample of my writing before signing up, you can do so here. We'll be giving away the prizes separately SO THERE'LL BE MORE WINNERS!!! who will be announced the first three Saturdays of December. Hi, ladies. I'm not really looking for any particular book on my Christmas list. If it falls in either the inspy romantic suspense or inspy historical drama, I'm a happy camper--at least as long as I haven't read the book already. LOL! Appreciate the giveaway. Hi, Sybil! I'm the same way. 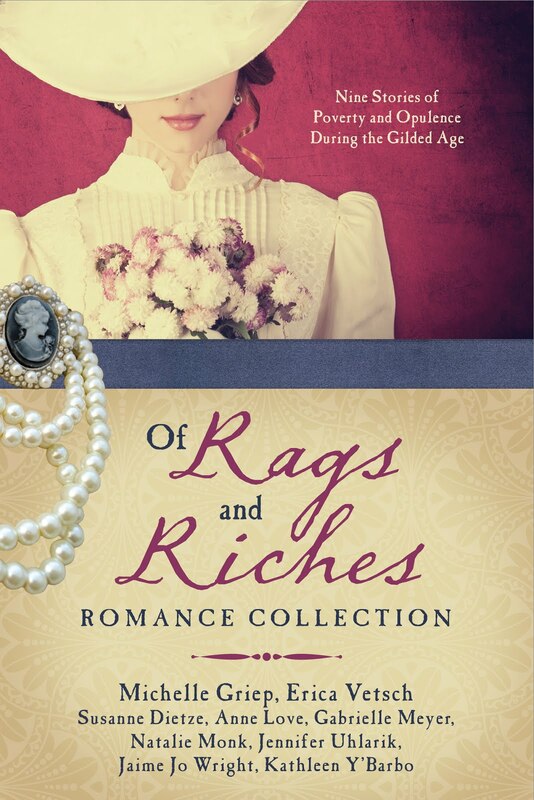 Inspy romantic suspense and inspy historical romance are my favorites. Especially any Christmas themed! Thanks for coming by! Best wishes in the contest! Deanna, I'm a fan of the Smitten series. Such a fun premise and eclectic characters. Sybil, I've never been a big suspense/murder-theme fan, but I just read Without A Trace by Colleen Coble and loved it! How can I pick just one book??! Lol. There are several books on my "to read" list. I have a couple of the Mrs. Jeffries books, which are Victorian mysteries. The Victorian era is my favorite era of literature, and I love mysteries, so this was a perfect book for me! 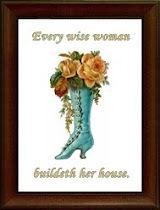 :) Plus, I read that Mrs. Jeffries is the Miss Marple of Victorian mysteries--again, perfect! Hi, englishmysteriesblog! ;) So great to see you here! Can't wait to see your blog once it's up! I love Victorian mysteries, too! i haven't read a whole lot of them, but I have a few on my to read stack as well!!! I'd love to be entered to win any of these prizes! :) Love to win new books especially--books are my husband's and my downfall; as we've gotten older, we don't "need" much (except maybe a million dollars--to fix up our house, pay taxes, move to the middle of nowhere), but we can't resist books--new, used, dog-eared and well-loved. I'm more of a contemporary reader, but I've found myself reading more and more historicals this year, especially as I've gotten to be friends with some of the authors. I've been enjoying them, that's for sure! Hi, Melanie! I love books, too! I don't know if you have the free Kindle app or not, but I post free and bargain ebook deals on my Facebook page almost every week. It's great for when the book budget gets low. Great to see you here! Hope you have a fabulous Christmas! I don't have a particular book on my wish list but anything by Mary Connealy is sure to be on my wish list. Stopping by your place after reading about your giveaway over in Seekerville! Fun to see you and Courtney working together. What a great idea! I love inspirational romance-both historical and contemporary....and the Christmas stories are such a treat. Thank you and Christmas blessings to you both! I enjoy reading Inspirational Historical Romance books. 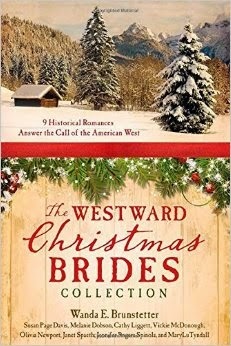 I would love to read the Westward Christmas Brides Collection. I appreciate this giveaway! JAMIE!! Great to see you here! Ha! Same here! I'm always up for a laugh, and nobody writes comedy like Mary! HEIDI, I have heart TONS of good things about Edenbrooke, and it's on my wishlist as well! Thanks for commenting! SHERIDA! Great to see you here! Thanks so much for letting us know where you heard about the giveaway! 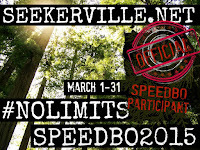 Seekerville is the best, isn't it? I have a feeling if I ever get pubbed, the Seeker's names are going to make up a HUGE part of the acknowledgments! They're amazing. Thanks so much for supporting us! Best wishes in the contest! THE ARTIST LIBRARIAN (ZEKKAINA), so great to have you here. Those are some fun titles! My brother is an artist, so he loves those movie art and costume books as well! I do to, and am usually sneaking his copies to read. :) Thanks for entering the contest! 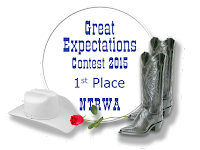 Best wishes on winning! JUNE HORNE, thanks so much for entering! I know! Historical + Christmas. Can't get much better than that, right? 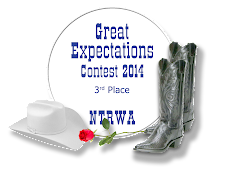 Best wishes in the contest! I am hoping to get Jodie Picoult's newest book for Christmas. Hi, Lisa! Thanks for entering the contest! We're on to the next part of our giveaway where we're giving both the Hope for the Holidays Collections if you'd like to enter there! Best wishes! Natalie, I signed up for the newsletters but only got a confirmation for Courtney's. Am I signed up for yours? Hi, Tina! I'll check! If not, I'll go through Rafflecopter and add you manually. Thanks for letting me know! Tina, I've got you in the list, so it must have recognized the name or email. You're good to go! Thanks so much for entering! Book-lover's Christmas Giveaway Part 4--THE END!